Dodge is continuing the teasing game for the new Dodge Challenger SRT Demon. Dodge has uploaded a new video clip – the third one in as many weeks – that shows a more solid look on the new Dodge Challenger SRT Demon, although all it showed was the muscle car’s rear end and its wheels. The past two teaser clips – titled “Caged” and “Reduction” were more enigmatic than solid. The teaser game changed in the third teaser clip titled “Body.” This teaser clip lasts for only 27 seconds but the information it showed is already helpful. Basically, the video shows the Challenger SRT Demon revving up and spewing up some smokes. It also showed the Demon’s wide tires as well as its tire tracks. 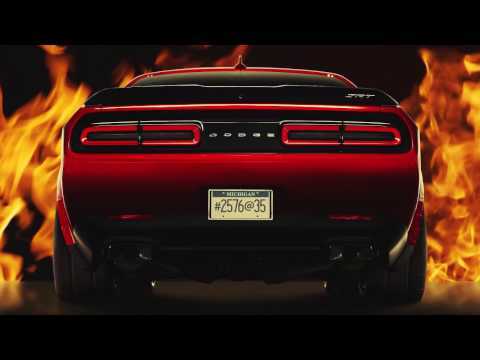 Near the end of the third video, the rear end of the Challenger SRT Demon was shown, indicating that not much else has changed on the posterior of the Challenger SRT Hellcat. What is amazing about the latest teaser is the fact the wide drag radial tires – measuring 315 mm (around one foot) in width -- of the Dodge Challenger SRT Demon is fitted straight from the factory. These could be the widest front tires (315/40 Nitto NT05R tires) that have been installed on a production vehicle. Of course, if we are talking about tires of this width, the purpose would be maximizing as much traction from a drag launch. These tires are developed specially for the Dodge Challenger SRT Demon and boast of a new compound and specific tire construction. The new Dodge Challenger SRT Demon will be more than 200 pounds lighter than the Dodge Challenger SRT Hellcat. A 2017 Challenger SRT Hellcat with a manual transmission has a weight of around 4,448 pounds (2,018 kg); so the Challenger SRT Demon will weigh around 4,200 pounds. It is very much expected that the new 2018 Dodge Challenger SRT Demon will have more output and more torque than the 2017 Challenger SRT Hellcat, although that remains unconfirmed. Dodge could confirm that in one of the succeeding teaser clips, and once confirmed, it means that the Challenger SRT Demon will be more hellish in performance than the Challenger SRT Hellcat. The Hellcat is powered by a 6.2-liter supercharged HEMI V8 engine that could deliver 707 hp of max output and 650 lb-ft (881 Nm) of peak torque. Dodge will be releasing a total of 12 teaser videos before the model’s eventual launch at the New York International Auto Show in the third week of April 2017. Three videos have so far been released, and we expect juicier details to be unfurled in every succeeding clip. The last of these teaser clips will be shown as the Dodge Challenger SRT Demon is unveiled in New York City, just before the New York International Auto Show.